Using shards of shattered glass and metal scraps as weapons, inmates at an overcrowded California prison went on an 11-hour rampage on Aug. 8, leaving some 250 people injured and a prison dormitory burned to the ground. Officials believe the riot at the California Institution for Men  the state’s worst since 2006  was fueled by racial tensions between black and Hispanic inmates. The violence came as California’s prison system is adapting to a 2005 Supreme Court ruling making it more difficult for facilities to automatically segregate new prisoners by race, as the state had done for more than 25 years to defuse potential violence. A spokesman for the prison system said integrated prison blocks may have contributed to inflamed racial tensions prior to the riot. Prisons are violent places by nature; America’s first recorded prison riot took place even before the Declaration of Independence, in Connecticut’s Newgate prison in 1774, and uprisings continue to this day. One report estimates American correctional institutions saw more than 1,300 riots in the 20th century. Prison insurgencies can be tied to a wide range of causes, including racial tension, gang rivalries, individual feuds and general grievances against guards and prison administrators. 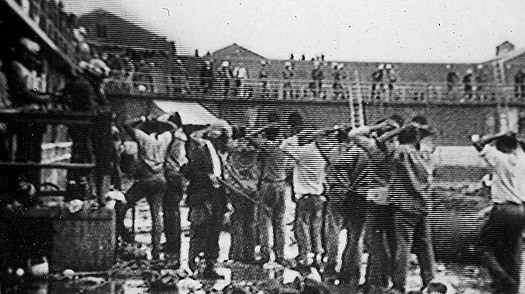 The nation’s deadliest uprising took place over four days at upstate New York’s Attica Correctional Facility in 1971. More than 1,000 prisoners rebelled, holding dozens of guards hostage and issuing a series of demands to improve living conditions . After negotiations broke down, authorities forcibly retook the facility, using tear gas and live ammunition. The violence killed 32 inmates and 11 guards. Other infamous prison disturbances include a particularly gruesome 1980 uprising in New Mexico that claimed 33 inmate lives and an 11-day siege in 1993 at a maximum-security prison in Lucasville, Ohio, in which a guard was killed. As bloody as prison uprisings have been in the U.S., they are often far more violent abroad. Indeed, the full worldwide toll of prison violence is likely unknowable, considering the restrictions on press freedom under many of the world’s more repressive regimes. One of the deadliest incidents in recent decades took place in 1992 in São Paulo, Brazil, where 111 prisoners were killed as authorities sought to put down an uprising. Human-rights groups accuse corrections officers of shooting inmates indiscriminately, even those who had surrendered. A Brazilian police colonel was sentenced to 600 years in jail for using excessive force in retaking the prison; the conviction was later overturned.